Linda MacAulay. Artist. Lover of the outback and quirky characters. 10 Questions with Linda MacAulay - Artist; "art is serious but I am not". Hello there! It's Frankie here, and hoo boy you are in for a treat today. Firstly, I've got to say again, I love my job! Who else gets to troll around looking for worthy subjects to interview in their fields of expertise?? After this interview with Linda, I was immediately fired up to try out some of the amazing mediums she talks about. And you always know someone who lights you up is going to be a fantastic teacher as well. 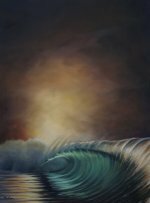 Q: Your artworks are imbued with striking colour and a sense of fun, but also depth and “soul”. Is there a particular approach or technique you employ to ensure that happens? Whilst I am a realist artist, I paint my emotional response to the subject rather than accurately representing it like a photograph. How many times do we look at our photographs and find they just don’t capture what we saw! It’s about painting what the eye and the heart sees rather than what the camera sees. A little creative licence with colour and shape can help us connect emotionally and truly capture the spirit of the subject. Often I slightly exaggerate the thing that first struck me about the subject be it a colour, texture or the size and shape of the subject. It’s essential to paint from your own reference material as that personal connection is evident in the artwork. There is no point in painting Venice when you have never been there. I spend a huge amount of time immersed in the environment I paint and work from all my own photographs, notes and sketches. I guess I am also a bit of a bogan* in the fine art world and really just love to have a bit of fun. I try not to take it all too seriously. When I studied art it was all just way too serious….life is so much easier with a smile. Q: Has the accessibility of the online world changed the way you do business as an artist? Totally….I sell more artwork though social media now than any other outlet. People however are still seeking an authentic connection with the artist be it though online chat or in person. Q: Is there anything you wished you knew 5 years ago? The Facebook algorithm….and how to use Instagram properly. Marketing is such a huge challenge for artists and constantly changing. Social media sites like Facebook have been a great tool in the past but you really needed to understand how it works. Instagram has taken over now as a marketing tool but it is reaching it’s used by date for artists as well. I wish I had a crystal ball to know what the next big thing in social media is. Any suggestions are welcome. Q: What is your advice for creatives just starting on their visual arts journey? If someone wants to buy your work….sell it and use the money to buy more art materials. Don’t hold on to anything as creativity is an unlimited resource. Think of it like an energy flow. Connect and network with other artists as this network will be a lifeline further down the track. I think I have learned more from my artist friends than through study. It is also great to talk to someone who “gets it” when times are tough. Experiment, play and have fun. Forget about the outcome and look more at the process. Don’t be too hard on yourself as you will shut down learning which is a lifetime process. Some of my biggest discoveries come out of play. Q: What is the most wonderful thing that’s happened to you as a direct result of your teaching or arts practise? I get to travel to some amazing places and meet and work with some incredibly talented people. I think one of the biggest blessings (and at times the biggest curse) is that everyone wants to share their story with you. I get lots of inspiration from listening to other peoples’ stories but also feel incredibly honoured when they choose to do so. Q: What has been your most challenging or frustrating moment as a professional artist? Dealing with the criticism and knockbacks. You paint a little of your soul into every artwork and then put it out there for everyone to critique or judge. At times you need a really thick skin. You just have to keep telling yourself that not everyone is going to love what you do…….. you just have to find the people who do. 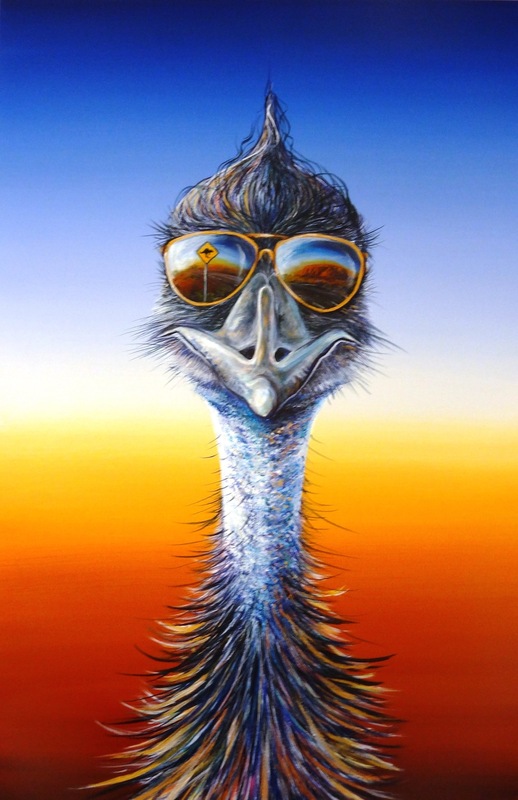 Q: You seem to have a real “earth connection” - we love your paintings of the Central Australian outback, gorges and rocks. 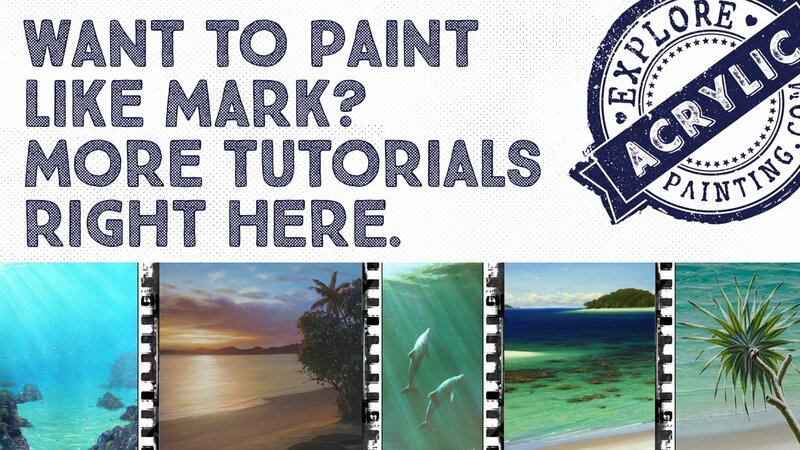 However, is there a particular subject matter you enjoy painting most? There is something magical about being in an area far removed from human activity. It’s where I recharge and painting these areas brings me peace. 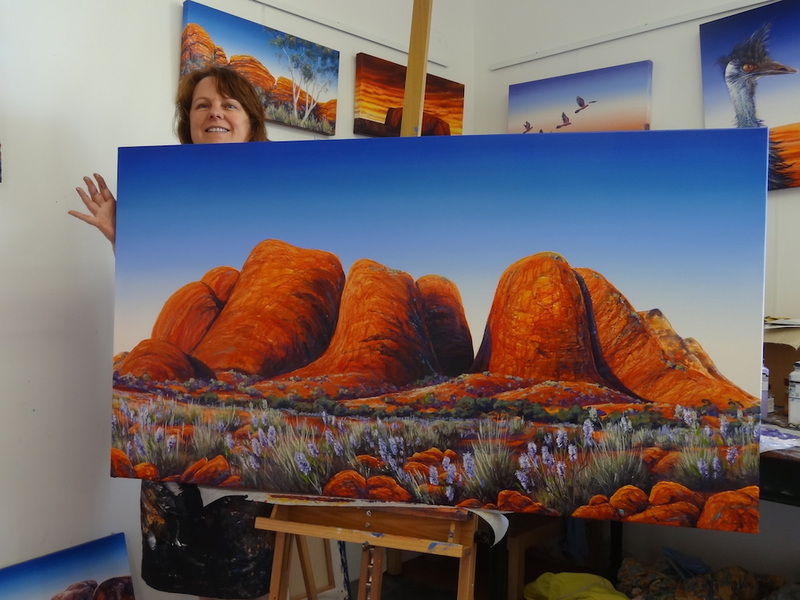 It’s then no surprise that I love painting remote areas and am passionate about the Australian landscape. My son once described my work as being about the elements……earth, air, water and fire. 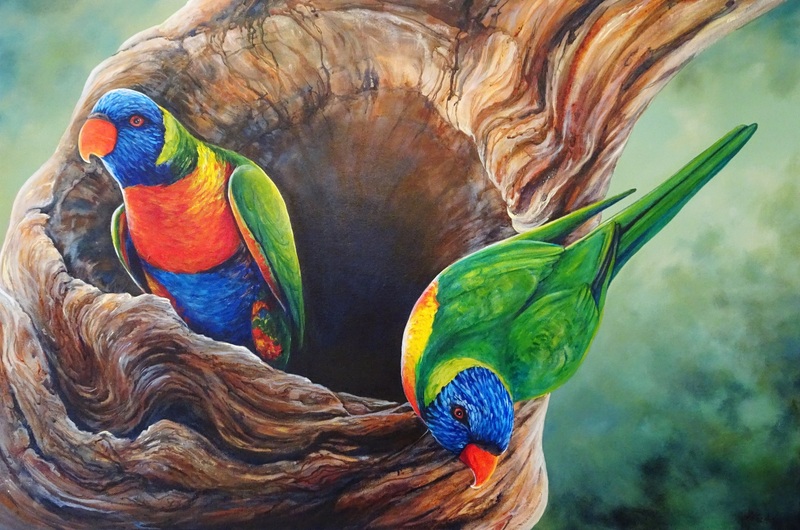 I also love painting animals but this work is more a reflection on the human condition than wildlife art. I use animals to reflect on those WTF moments in life and comment on man and his place in the environment. 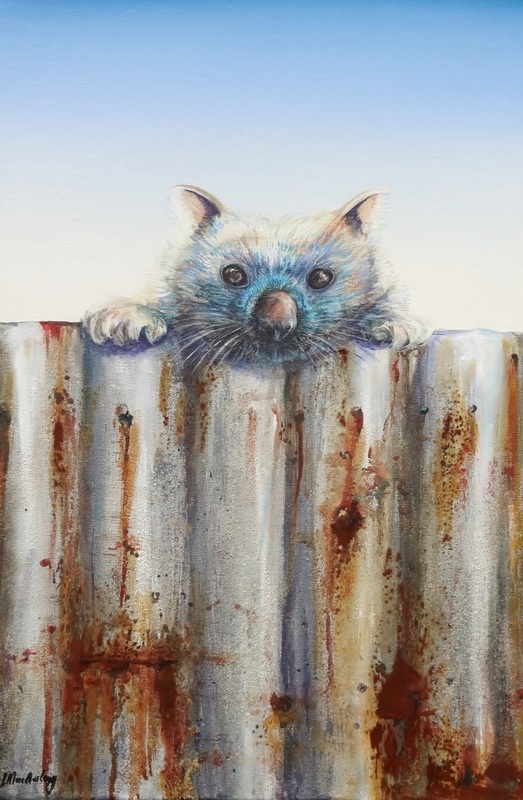 I have personally met every animal that I paint and use anthropomorphism to give my animals character. Q: Matisse have such a huge range of mediums - both dry and wet - what are your 5 favourites and why? Impasto - I use this to add textures to my landscapes and love it as it is both strong and flexible. Most of my work goes overseas so it has to be able to be taken off the stretcher bars and rolled. I vigorously test all my products and chose the Matisse Impasto for its durability. I have even run over this (accidently in my car) and the Impasto flexed back into shape without a crack. Drying Retarder – I add this into paint to increase drying time or spray it onto my palette to stop paint from skinning over. It is an essential tool in controlling the drying time of acrylics. Acrylic Painting Medium - I always use this to thin down my paint and help bind it to the canvas. I never use water to dilute paint. Water breaks down the binding capacity of the paint which results in glazes that are water sensitive. This means that they can be rewet or disturbed even once they have dried. I really drill this into all my students as I used to work in a picture framers where we got many paintings in to be cleaned…..it’s impossible to clean a painting where the paint has been thinned down too much with water. Ferrous Powder - Creates genuine rust effects when mixed in with the paint and treated with an oxidising solution. I love the genuine rust effect this creates. It creates tactile works that people can engage with. 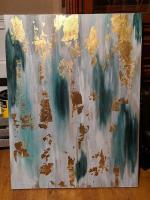 Iridescent Medium - I love a bit of bling and often use transparent glazes over this medium. This creates the illusion of light from within. Cooking or eating…in fact anything to do with food. My family believes I am always thinking about painting though. I can’t sleep with my feet covered. Every time I stay in a motel I have to completely unmake the bed before I get in……….. much to my husbands’ annoyance. Many thanks to Linda for taking the time to be a great interview subject for us! 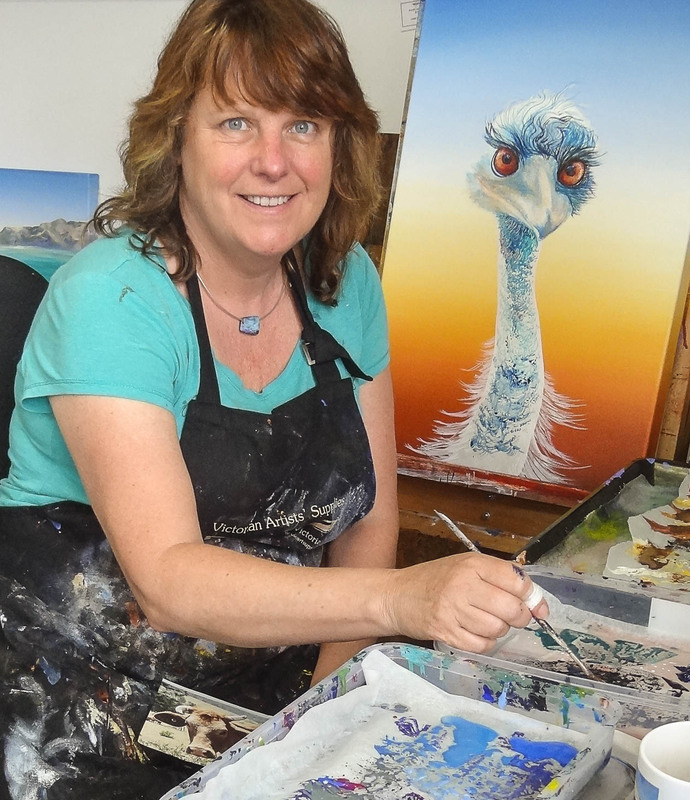 Linda is taking a painting tour in Oct 2017 to Norfolk Island that is a combination of quirky characters and plein air painting. Linda is also running a series of workshops on foundation skills from her studio in early 2017. These have been very popular and are designed for beginners who wish to learn skills like colour mixing and colour theory, brushwork, mediums 101, tonal painting and glazing. Interestingly, most the people who attended this year were professional artists or art teachers.